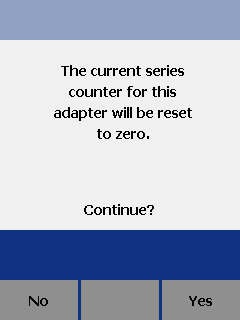 New to Version 1.41 (Current version is 2,78) is a trip style counter feature for your adapters - similar to that found in your car/truck. If you need to keep track of how many tests your DSP-PM06 has done, you can set the "Current Series:" to "0" by going to SPECIAL FUNCTIONS > Version Information > F2 > ENTER > F3 to confirm. 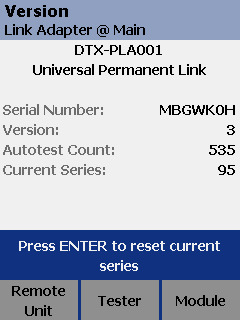 For example, the screen below tells us that this DTX-PLA001 has completed 535 Autotests. The Current Series: is 95, indicating that 95 tests have been ran since the last reset of "Current Series:"